MUSIKMESSE 2015: Focal Professional's new Trio6 Be line, on show for the first time in Frankfurt offers switchable two- and three-way monitoring, ideal for A/Bing on the fly. Essentially, the speakers comprise a 1" tweeter, a 5" woofer, and an 8" subwoofer, but you can turn the sub off, restricting frequencies to between 90Hz and 20Hz, simulating moire limited playback environments like TVs, PCs and standard in-car systems. 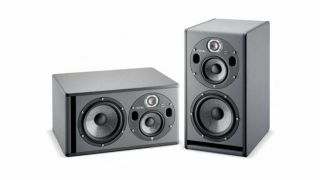 For more info, read on or head over to the Focal Professional Trio6 Be site. The Trio6 Be was designed to meet the standards of the most demanding engineers. This dual monitor is the new reference in its price range owing to its extreme neutrality, its precise stereophonic imaging, and its ability to resolve the most minute sonic details, while its Class G amplifiers deliver SPL levels to suit all musical styles. Switching to FOCUS mode reconfigures Trio6 Be in two-way mode. When utilised to its full potential, the Beryllium tweeter reaches up to 40kHz and the 8" subwoofer extends low frequencies down to 35Hz. This offers engineers complete control of the audio signal. The 8" W composite sandwich cone subwoofer is complemented by its large port integrated into the front baffle, making it easy to position the monitor near the front wall without saturating the ports and maintaining excellent low-frequency linearity. Its large front port guaranties consistent performance regardless of SPL levels. It also allows a positioning closed to a wall without wall boost effect, allowing an easy integration even in small rooms. The 5" W composite sandwich cone woofer is installed in an isolated chamber within the cabinet that prevents the sympathetic activation of its other speakers while optimising its acoustic performance. Two front-facing ports provide bass reflex, enabling the woofer to perform identically in both two-way (90Hz - 2.5kHz) and three-way (250Hz - 2.5kHz) configurations. The 1" pure Beryllium inverted dome tweeter provides numerous advantages, including wide dispersion, amazing frequency response linearity, quick dynamics, and unrivaled impulse response. As a two-way speaker, Trio6 Be employs only the 5" woofer and the tweeter, limiting frequencies to between 90Hz and 20kHz. This configuration provides the perfect compromise when checking the quality of the mix for playback systems with limited frequency response, such as TVs, PCs, cars, and portable speaker systems. The frequency response curve of the two-way configuration is identical, though less extended, to its three-way curve, allowing for a perfect comparison that preserves the stereo image. Focusing on this critical middle frequency range facilitates a good mix and enables the engineer to ensure that the levels are just right. A footswitch (not included) activates this configuration remotely from the listening position. A ¼" input jack on the rear panel receives the trigger signal from a remote pedal, while a ¼" output sends a link to the input on a paired monitor. Most singlebutton guitar amplifier footswitches are compatible. Trio6 Be may be used vertically or horizontally to optimise positioning thanks to an adjustable aluminum baffle housing the woofer and tweeter. This rotating baffle is capable of rotating 360° in 90° increments, making it one of the most versatile speakers to position.